The month-to-month volatility of the jobs numbers, and the magnitude of their eventual revisions, make it nearly impossible to draw new conclusions from a one-month hit or miss relative to expectations. The fact that new private sector jobs increased 134K in August, well under expectations of 198K, is therefore not indicative of any sudden deterioration in the jobs market or the jobs outlook. As the following graphs show, all of the recent trends in the labor market remain unchanged. The August drop in private sector job creation falls well within the normal range of this series on a month-to-month basis. Job growth by this measure is still averaging just under 200K per month, as it has for the past several years. 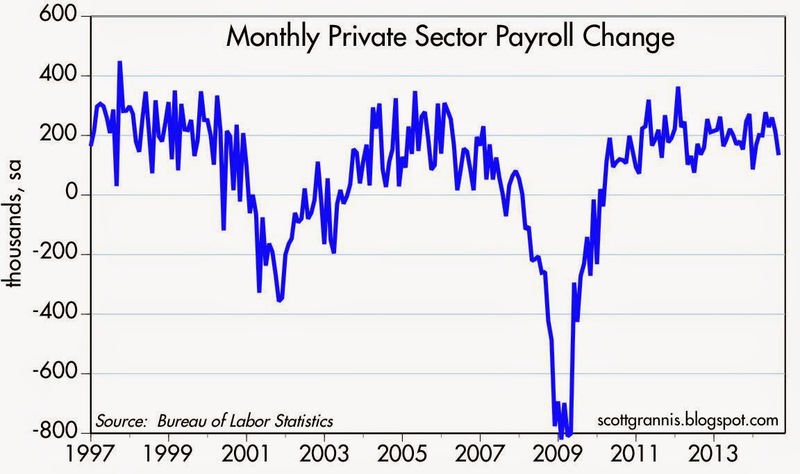 The six-month annualized growth rate of private sector jobs is still just a bit above 2%, the same rate we have seen since early 2011. Total private sector jobs are making new highs, and have increased by over 8 million in the past five years. 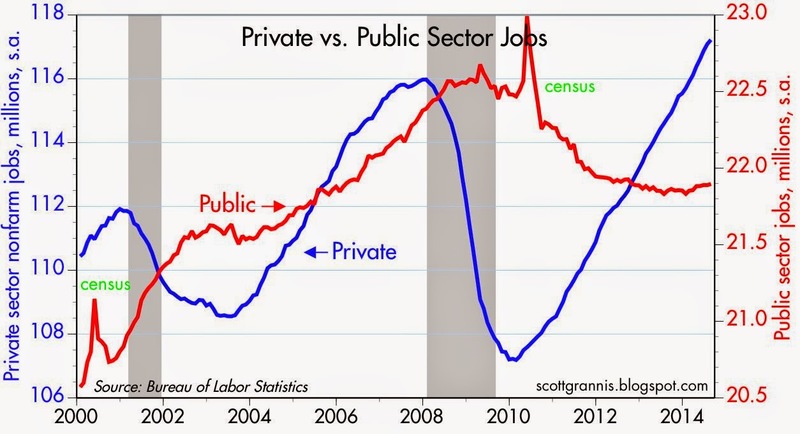 Public sector jobs are no longer declining, and are now growing very slowly. 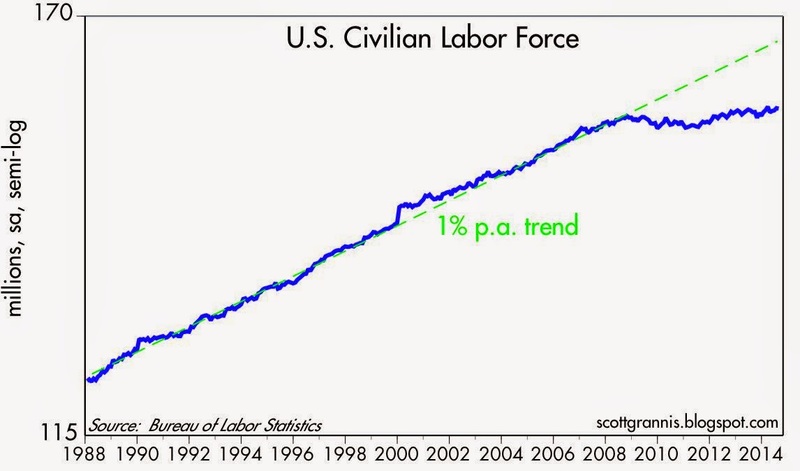 The labor force is still growing at a miserably slow rate. 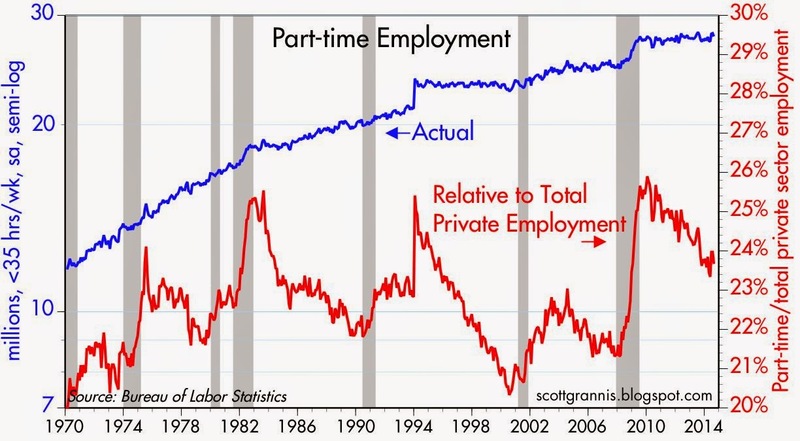 Part-time employment is still relatively flat, and is still declining slowly relative to total employment. This is the same pattern we have seen in nearly ever recovery in the past 50 years. Conclusions: The economy is likely still growing at a 2-3% pace. It's still a very sub-par recovery. There is no sign of a recession or a boom. Things are not likely to change materially unless and until we get some improvement in fiscal policies (e.g., reduced regulatory burdens, lower and flatter marginal tax rates). In spite of the 0.45% gain in the S&P 500 to a record close of 2007.7, there were only 101 new highs made today and 31 new lows. The market is looking tired. No doubt many in the market are feeling tired, if not very worried about a correction. One problem is that the Fed, with its zero interest rate policy, has not given anyone a place to rest. Resting on the sidelines pays next to nothing, so it has a significant opportunity cost. 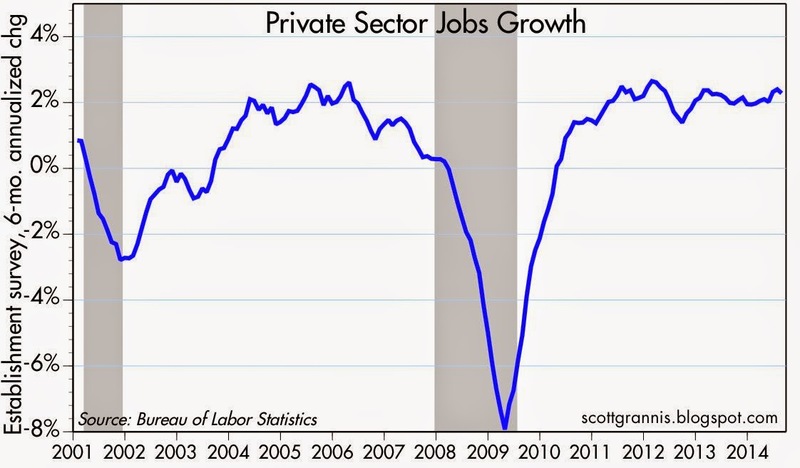 As always, great post---but employment growth remains feeble. In the 1990s we had more-robust employment growth, but inflation remained moderate. The 1990s had the type of job growth the Fed should target---and all government. Monetary asphyxiation will bring neither more growth or higher interest rates. When, in history, did interest rates stay in ZLB when a central bank printed lots of money? If higher interest rates are advisable, it will take years and years of robust growth to get such. Capital is abundant and cheap today. I think the Fed and federal government should shoot for robust growth and properity, and see if that can bring higher interest rates. I am surprised we are not getting better numbers before the elections! As Scott has predicted a few times and emphasized in early May, the EURO has fallen like a lead balloon from that recent high of 1.38+ to 1.29 today. Thank you, Scott! !